Co-located to Classroom 3 (can be reserved with that room for class breakout sessions and events.) Can be used with Classroom 3 streaming video system; please contact the Service Desk for more details. 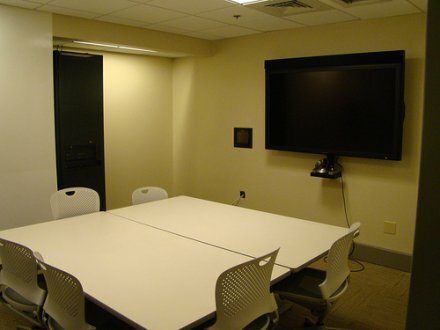 Co-located to Classroom 4 (can be reserved with that room for class breakout sessions and events.) Can be used with Classroom 3 streaming video system; please contact the Service Desk for more details. Due to the specialized videoconferencing equipment in the room, Group Study 11 has extra restrictions on access. This room is locked after 5 and on the weekends, and you must have a confirmed reservation to use the room during that time.